French niche line Memo will launch Eau de Memo, a new fragrance celebrating the brand's 10th anniversary. Eau de Memo was developed by perfumer Aliénor Massenet. The notes feature bergamot, lemon, saffron, jasmine, green tea, iris, white musk and leather. 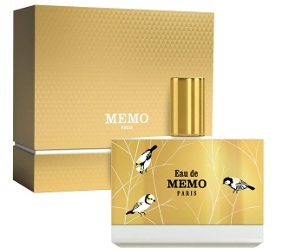 Memo Eau de Memo will be available in April, €200 for 100 ml, concentration unknown. Update: the brand's description ~ "A bird in flight. Mandarin. The beating of wings, the rustle of feathers. Bergamot. Gliding over Paris. An awakening of early memories, the essential Memo. A hint of leather. The whisper of the city in the sky, a fluttering heart. Oil of orange. A race to ever-greater heights, lost in the big blue. A burst of green tea. The hope of new horizons. Escape. Dive into euphoria, soar above the City of Light. Jasmine absolute. Leave forever, then return, an endless journey of discovery." I had hopes that an Eau would be an eau…. The notes sound intriguing and wonderful, but dang. $217 for 100mL. Oof! Wonder if it will be carried in the States? I would think so, most of them make it here.